SEQUALO (AUS) (Bay 1990-Stud 1997). 10 wins-3 at 2, MVRC AJ Moir S., Gr.2. Sire of 1047 rnrs, 719 wnrs, 20 SW, inc. Spirit of Boom (MVRC William Reid S., Gr.1), Star Shiraz, Burdekin Blues, Sequential Charm, Missy Longstocking, Show Biz Kid, Cariad, Tierqualo, Wolfe Dreams, Bold Glance, Flamenco, Agitate, Caliente, Magic Cat, Secrets Untold, Sequallan, Sequestrate, Shysu, Holding, Royal Shiraz, SP Seeking More, Seconde, Quelle Liaison, etc. Shoneck Affair (g. by Mossman). 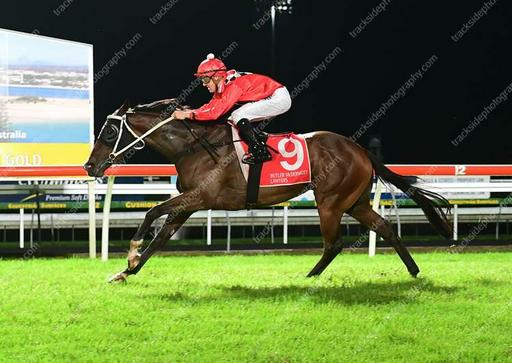 Winner at 1650m in 2017-18, Ipswich TC Tony Williams Memorial P., 3d BRC Hamilton Hotel P.
Princess Snowy (f. by Sequalo). 2 wins. See below. BRORAMA STAR (Brocco). 13 wins from 1200m to 2400m, A$277,215, TRC Hobart Cup, Gr.3, Purity Ingham Jockey Club Cup, TTC Longford Cup H., TRC Ingham Love'Em H., VRC Jayco Welter H., 2d Mornington Cup, L, MRC General Command H., TTC RW Trinder Memorial H., JA Dunn H., 3d VRC David Bourke Provincial P., TRC National Heart Foundation Summer Cup, VATC Morse Code H., 4th TRC Hobart Cup, Gr.3. ZERO DRAMA (Danzero). 7 wins from 1400m to 1800m, A$409,100, Kilmore Cup, L, MVRC Geoff Torney Cup, VATC 125th Anniversary H., New Statesman H., Jayco Caravans H., VRC Aluminates Chemical Industries H., 2d Pakenham Cup, MVRC Wedgwood Vase H., Kwik Lok Welter H., Good Luck in 2004 H., VATC Lord Reims H., VRC Tauto Welter H., MRC Samson H., MVRC Scobie Breasley H., Strathayr 2YO H., Qantas Skybed Classic H., Jack's Satay Bar H., 3d MRC Silvan Australia P., MVRC TROA Owner Privileges for a Day H., VRC Hahn Premium Light H., MVRC Trademark DM H., VRC True Version 2YO H., 4th Kilmore Cup, L.
Bonne Affaire. 2 wins. See above. Countersnip - Po Ching Treasure (H.K.) (Stratum). 4 wins-1 at 2-from 1200m to 1800m, A$126,450, HK$3,104,075, to 2016-17, HKJC University Hall H., Grass Island H., MRC CRV Hospital Helping Hand H., 2d MRC Autumn Classic, Gr.2, HKJC Collection H., France Galop Cup, Mei Zhou Hero H., Murray H., Gloucester H., SAJC Ryan Ferguson H., 3d TTC Tasmanian Guineas, L, MVRC Alternate Railway 2YO H., HKJC Chevalier Property Development H., Community Contributions H., Iris H., Tiu Keng Leng H., MVRC TM Design Inglis Bonus H.
LIM'S OBJECTIVE (O'Reilly). Champion 3YO in Singapore/Malaysia in 2007. 8 wins from 1200m to 1800m, S$931,498, Singapore TC Raffles Cup, L, 3YO Challenge (3rd Leg), L, 3YO Challenge (1st Leg), L, Open H., Class 4 H.-3 times, 2d Singapore TC 3YO Challenge (2nd Leg), L, Open H., 3d Singapore TC Kranji C S.
2 wins-1 at 2-at 800m, 1000m to 2017-18, 3d Ipswich TC Carlton Draught H.